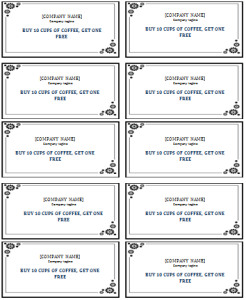 Punch cards are used broadly around the businesses which are emerging or are promoting themselves; it’s also popular in different aspects of life and world. It’s a simple technique to boost the promotion of a business or the new offers available. One can publish these cards to ease the regulars of the business. It can either give discounts or extra incentive every time a customer visits and the card is punched on the mark at the time of receiving those benefits. In today’s world, how hard could it be to designs and print punch cards? All you have to do is find a website which costumes the user’s interface. Next is all text book. Find the appropriate words, headings, picture (logo) and some circles to be punched. Choose the color and apply it on the card. Or if you want to design it all by yourself than our computers are equipped with the software known as Microsoft Word. Run the desktop app and open ‘New Blank Document’. A blank page will open in window. 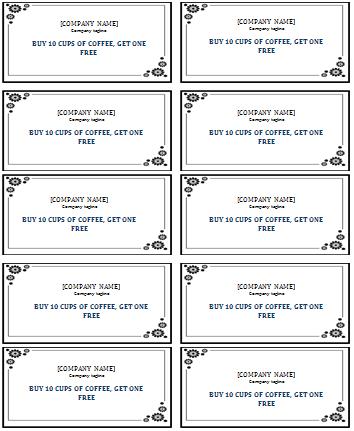 Click on the word box and draw the box which will serve as the punch card. Choose fonts from the toolbar and write the desired words. Right click on the box and fill it with the color you want. Then choose auto shapes from the toolbar and draw the shapes you would like to be punched. Right click on the shape and paste it under or beside the shape and keep on doing it till you reach the desired numbers of shapes. If it suits you print the cards and cut them into shapes of a card. If one wants to save his/her time the easy and fun way is to visit websites and choose the templates which are already designed. Print the one of the choice and use it according to the need.